Figure 5 is a computer-generated pattern of only solder paste areas. 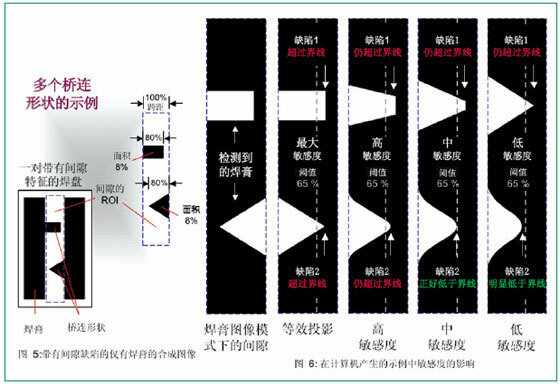 In the pad gap, there are two different defects; each defect actually covers 8% of the entire gap; the total area of â€‹â€‹the solder paste within the gap is 16%. When all the contributing factors are taken into account, they may still be included within reasonable process variations. In order to avoid the interference caused by the detection, it is best not to set the boundary of the solder paste in the gap too low. In this example, the span information is usually a very useful "indicator" for possible bridging. Each solder paste pattern across the gap, or an extended solder paste pattern, is also 80% of the gap length. Different geometries were chosen to demonstrate how these figures affect the possibility of bridging. In order to better demonstrate the possibility of their respective bridging, the two figures are separated further and protrude from opposite sides of the gap to demonstrate the equivalent efficacy in determining "effective" crossings. Of course, when the solder paste patterns in the gap are directly connected together, or are very close together, this extension will merge into an effective bridge pattern across the gapâ€”and the possibility of defects will be more accurately estimated. come out. FIG. 6 demonstrates the effect caused when different sensitivity settings are applied to the gap region in FIG. 5 . The gap area under a synthetic paste pattern is shown on the left. White is solder paste, black is not. The remaining gap area is created directly from the processed data and highlights the difference in the effective (internal) nature of each shape at different sensitivity settings. The same user-defined gap boundaries are shown in vertical dashed lines in each source image and annotated graph. In this example, bridging defects are reported at each sensitivity setting because at least one of the graphic shapes in each case has exceeded the user-defined 65% span limit. In general, similar ideals and/or actual graphics tend to maintain more bridging possibilities after processing than small, realistic graphics. The user-defined sensitivity setting has a quantified effect. The reported results are similar to the likelihood of a similarly shaped bridge in the real world.